Clandestine giveaway! Win one of 100 copies of this Cold War espionage game worth $24.99! At least once in everyone’s life, there’s been a time where you’ve turned to a friend after watching some exuberant spy film and said the words “I could do that” with brimming confidence. 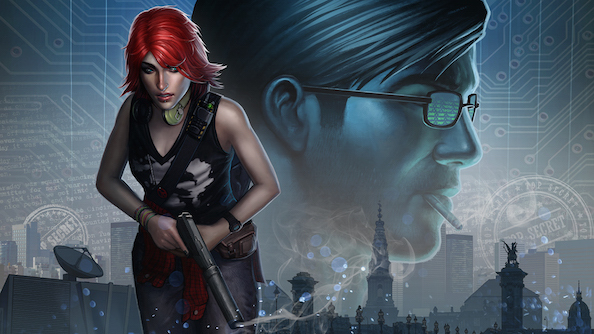 Well, now you can put your skills to the test with Clandestine, a stealth and hacking game that can be played in either single player, or as an asymmetrical co-op experience with a friend. Set in a paranoid, post-Soviet Union world, you control Katya and Martin, two field operatives sent to investigate the murders of a string of Cold War veterans. Whilst controlling Katya, the game becomes a third-person stealth affair, where you can rely on takedowns to avoid risky combat, and go into situations guns blazing depending on your style. Martin, your partner (or yourself in fact, since you can swap between characters at will) will be your eyes on each mission, using his camera feed and blueprint map of each level to make sure you avoid detection by tracking enemies and cameras, assist the spy by supplying ammo or health drops, and also hack electronic doors and computers for intel. Best played co-op, Clandestine can prove to be an often hilarious test of the strength of your friendship. We’ve got 100 copies of this Cold War thriller, worth $24.99, to give away. All you have to do for a chance to win is enter via our widget below. The actions you complete in the widget – such as following us on Twitter, the more chance you’ll have of winning. We’ll also need your email address. Not for anything nefarious, just so we can email you a code if you win! Should you win, you’ll be given a code to redeem on Steam. Just click the ‘Add A Game’ button at the bottom of the Steam client window, and ‘Activate a Product on Steam’. Follow the instructions, download the game, and get playing! Interested in more giveaways? We’re doing them all the time here at PCGamesN. Just throw us a Like at the PCGamesN Facebook page, and we’ll keep you in the know.